AN INSTALLATION BY BRIGITTA ZICS & CO. JOHN SHEAER CURATED BY MIKLÓS PETERNÁK. 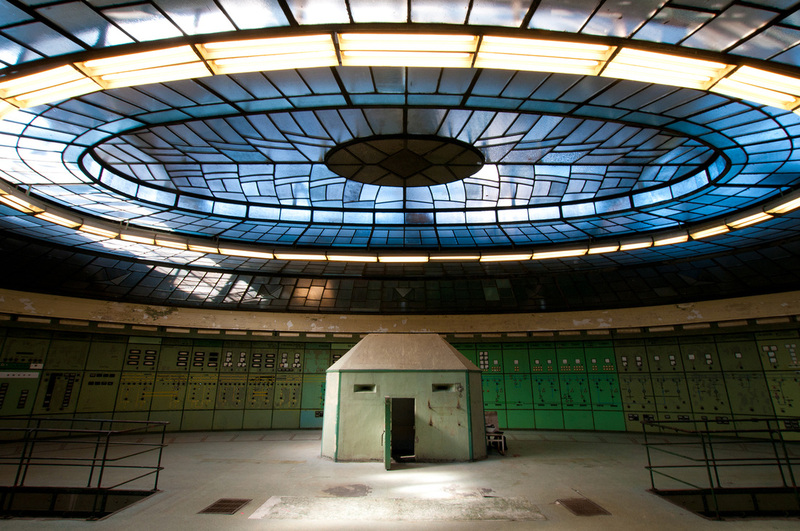 EYE RESONATOR AT THE POWER PLANT IS AN EXHIBITION THAT BRINGS TOGETHER TWO FUTURE-SENSITIVE ARTWORKS OF DIFFERENT TIMES. EYE RESONATOR IS AN EXPERIENTIAL ARTWORK THAT RESPONDS TO EYE MOVEMENTS WHILE TRYING TO CAPTURE THE IMAGINATION, ENGAGE THE INTELLECT AND EXCITE THE EMOTIONS OF EACH VIEWER. THE IMMERSIVE INSTALLATION SET VISITORS ON A FICTIONAL JOURNEY OF THE FUTURE WHILE BRINGING ALIVE THE DAZZLING ART DECO DOME OF THE POWER PLANT’S CONTROL ROOM, A MASTERPIECE BY THE HUNGARIAN ARCHITECT VIRGIL BIERBAUER. THE CONTROL ROOM IS THE SETTING FOR THE DOMED ‘CUPOLA’ OF THE EYE RESONATOR AND INVITES YOU INTO ITS MULTISENSORY ENVIRONMENT. SOUND, TEMPERATURE AND LIGHT THEN SET YOU FREE ON A JOURNEY OF SELF-EXPLORATION. EACH ENCOUNTER WITH THE SYSTEM IS UNIQUE AS IT REACTS TO THE VOLUNTARY AND INVOLUNTARY RESPONSES OF THE INDIVIDUAL CREATING A TENSION BETWEEN BEING IN CONTROL AND BEING CONTROLLED. EYE RESONATOR AT THE POWER PLANT EXPLORES THE FACULTY OF PERCEPTION AND ASPECTS OF SELF-AWARENESS BY MEANS OF AESTHETIC PLEASURE AND BOREDOM. DOME EMBRACES VISITORS FOR IMMERSION. THE EYE GLASS EYE DOME ± EYE RESPONSIVE ENVIRONMENT. CONTROL ENACTING CONTROL IN ORDER TO RESONATE. RESONANCE RESONATES YOUR BEHAVIOR TO LAUNCH YOU ON A JOURNEY. EXPERIENCE PREPARES YOU FOR A JOURNEY OF SELF-REFLECTION. EYE RESONATOR UTILISES EYE-TRACKING AND REAL-TIME DATA VISUALISATION TECHNOLOGIES. IT IS A HUMAN-COMPUTER FEEDBACK SYSTEM THAT UPGRADES ITS EXPECTATIONS TOWARDS THE VIEWERS BASED ON THEIR PERFORMANCE OF CONTROL. IT INCORPORATES AN EYE-RESPONSIVE MURMURATION ALGORITHM THAT TRANSFORMS IN RESPONSE TO THE INDIVIDUAL’ S BEHAVIOR. READ MORE AT EYERESONATOR.COM. THE UNIQUE CULTURAL HERITAGE SITE OF THE CONTROL ROOM IS LOCATED WITHIN THE UNINHABITED SECTION OF THE STILL OPERATING POWER STATION WHICH WAS LAST IN FUNCTION IN 1996. 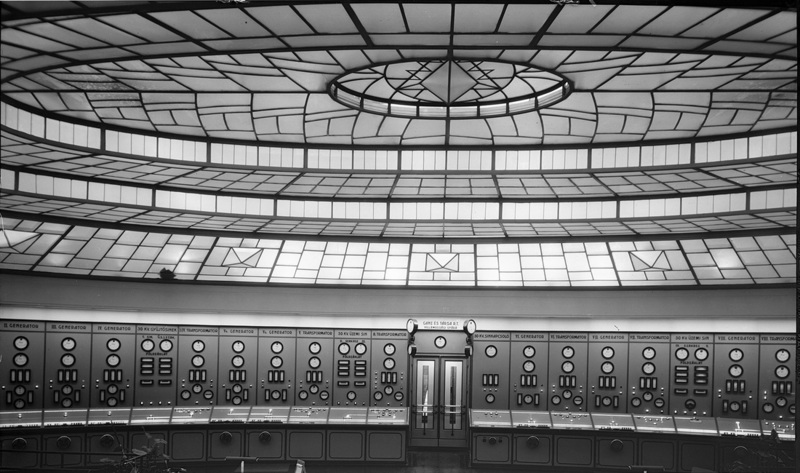 THE BAUHAUS STYLE POWER PLANT OPENED IN 1914 AND THE ART DECO CONTROL ROOM WAS FINISHED ACCORDING TO VIRGIL BIERBAUER IN 1928. UNMATCHED IN DESIGN AND ATTENTION TO DETAIL, THE POWER PLANT IS ONE OF THE MOST OUTSTANDING EXAMPLES OF THE INDUSTRIAL ARCHITECTURE IN THE AGE OF ELECTRICITY.